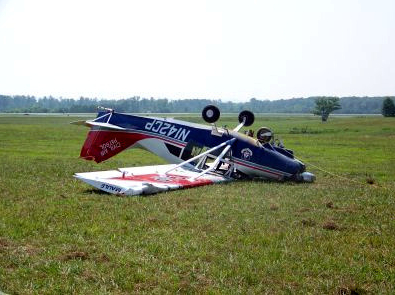 On July 21 2008, at 10:30 eastern daylight time, a Maule MT-7-235, N142CP, nosed over during landing roll at Richard B. Russell Airport (RMG), Rome, Georgia. The airplane was substantially damaged. The airline transport pilot was not injured. Visual meteorological conditions prevailed at the time of the accident, and no flight plan was filed for the personal flight. The airplane was registered to and operated by the Civil Air Patrol, under the provisions of Title 14 Code of Federal Regulations (CFR) Part 91. The flight departed from RMG the same day at 10:15. The pilot stated that during the initial touchdown, the nose gear collapsed. He said that as the airplane slowed down, the propeller dug into the ground and the airplane stopped suddenly and nosed over inverted. Examination of the airplane by a Federal Aviation Administration inspector revealed that the nose gear oleo strut was broken and the firewall was buckled. The nose gear oleo strut was sent to the National Transportation Safety Board materials laboratory for further examination. Examination of the oleo strut revealed that all of the fractures were on a slant plane and were consistent with over-stress fracture. During the initial touchdown the nose gear collapsed. Examination of the airplane by a Federal Aviation Administration inspector revealed that the nose gear oleo strut was broken and the firewall was buckled. Examination of the oleo strut by the National Transportation Safety Board materials laboratory revealed that all of the fractures were on a slant plane, and were consistent with over-stress fracture. The fractures occurred under bending over-stress. No indication of any pre-existing fatigue cracking or corrosion. The pilot’s improper landing flare which resulted in a hard landing. Be the first to comment on "South Carolina CAP Plane Flips at Rome, GA Airport"